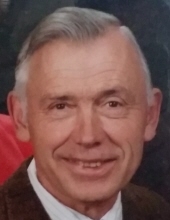 Warren Balgooyen, 79, most recently of Norridgewock, Maine passed away January 11, 2019. Warren was born in Scarsdale NY 12/19/1939, and the family moved to Briarcliff Manor NY when he was a young child. The family home was a short walk to a winding woodland stream, an environment that invited exploring by youngsters in the days when children were allowed - encouraged even - to go out and play by themselves from the time they walked home from school until suppertime. Indeed, playing, exploring and learning about nature defined Warren’s childhood. When his family moved to Katonah NY before he started high school, his explorations took him to other rivers as well as to several nearby lakes. Cross River Reservoir, within biking distance of home, allowed Warren to use his father's rowboat, which was stowed in the woods along the shore. He spent many hours there and at other bodies of water, fishing from the boat, from shore, or through the ice in the wintertime. Warren’s father, brother, and other friends and relatives were his beloved companions on these fishing expeditions. Warren discovered Maine as a student at Colby College and an enthusiastic member of the outing club. After graduation in 1964 with a BS in Biology, he worked at Kitchawan Research Laboratory, a field station of the Brooklyn Botanic Garden located 20 minutes from his family's home. Warren found lodging on another property recently donated to the Botanic Gardens. This lodging was in an old carriage house situated on several hundred acres of undeveloped land and featuring a large pond, called Teatown Lake. After daytime work at Kitchawan studying the effect of air pollution on plants, Warren spent his evenings making trails around Teatown Lake. Eventually, the trails and the nature museum he established became Teatown Lake Reservation, a nature center well used and appreciated by many groups of school children, families, volunteers and noted naturalists such as Richard Leakey and Euell Gibbons. The reservation remains an important educational and natural recreational area and now encompasses more than one thousand acres of protected land in a densely-populated region. In 1982, Warren, the founding director/naturalist at Teatown, and his family moved to Maine, to establish a new life in the farmhouse he had owned since 1970. Warren's work history in Maine included making trails at The Cooperative Extension office in Skowhegan, raising baitfish for ice fishing, cutting, splitting and delivering firewood, running a small landscaping business - Naturescape Landscaping, and making and selling maple syrup. Hobbies included hiking, canoeing, mowing fields, building and maintaining trails through his woods, creating ponds - especially for his favored water lilies. Thanks to the carpenter genes he inherited from his grandfather, he has built/re-built 7 cabins, two sugarhouses, and numerous garages and out-buildings. He taught classes at Skowhegan Adult Education for many years and helped establish the Ashley Wing Park in Norridgewock. He developed a self-guided nature trail at Orgonon, which is on the grounds of the Wilhelm Reich Museum in Rangeley, and created the Skowhegan Town Forest Nature Study Area with a pamphlet describing points of interest. Warren’s volunteer work included serving on several boards: Land for Maine's Future; Maine Audubon Society; Norcross Wildlife Foundation; Torrey Botanical Society, and Belgrade Regional Conservation Alliance (now 7 Lakes Alliance). He was a lifetime member of the Nature Conservancy and an ardent supporter of Somerset Woods, Maine Farmland Trust, The American Chestnut Foundation and numerous other environmental non-profits. Warren was a 40-year member of the Somerset Grange and a long-time member of the Norridgewock Historical Society. He also was a member of the First Congregational Church of Norridgewock, where he enjoyed singing with the choir. Warren was predeceased by another sister, Carol, and by his parents, Henry and Violet (Linden) Balgooyen. Warren is survived by: Helen, his wife of 50 years, and their two children, Christine Jones (Matt) of Leicester NC and Stephen Balgooyen of Niwot CO; 4 grandchildren, Linden and Sara Frances Jones, Willa and Luther Balgooyen, and by two of his siblings, Bruce Balgooyen of Chico CA and Marjorie Drysdale of Randolph VT, as well as five cousins and several nieces and nephews. A memorial service for Warren will be held at the First Congregational Church of Norridgewock on Saturday, January 26 at 2p.m. In lieu of flowers, please consider making a donation to the Congregational Church, 7 Lakes Alliance or to an environmental non-profit group of your choice. To send flowers or a remembrance gift to the family of Warren Balgooyen, please visit our Tribute Store. "Email Address" would like to share the life celebration of Warren Balgooyen. Click on the "link" to go to share a favorite memory or leave a condolence message for the family.